Vaccines have a long history dating back to the days of Edward Jenner (1749-1823) and Louis Pasteur (1822-1895). Vaccines can be viewed from a public health perspective as well as scientific perspective. Public health experts would focus epidemiological relevance, immunological competency, and technological feasibility. Scientists however will look for a good immune response as well as long-lived immunity, stability considerations, and safety issues such as danger of reversion to virulence. In India, the vaccine coverage is far from satisfactory, national average for full immunization being only 65%. Presently, nine vaccines are being used in the Universal Immunization Program. However, some more have started in pilot, and some are still in the pipeline. Although administrative, logistic and operational challenges have to be faced when introducing a new vaccine into the public health system; these are solvable and should not be a hindrance to the introduction. A real-life example of nonintroduction of a lifesaving vaccine is - the oral cholera vaccine. This vaccine which is manufactured and licensed in India has been the World Health Organization (WHO) prequalified, and it is being used worldwide. Although the disease is a major threat, the disease has its stigma and has led to its low reporting even from cholera endemic areas of the country. Thus, in spite of the WHO recommendations, the vaccine is not being introduced into the national program which would take it to people who need it the most only because of apparent lack of sufficient disease burden data and political commitment. Vitamin A supplementation (VAS) is presently being undertaken in India among under 5 (U5) children for two possible benefits (i) to prevent nutritional blindness due to Vitamin A deficiency (VAD) and (ii) to reduce U5 mortality. The existing scientific evidence suggests that nutritional blindness due to VAD has been virtually eliminated and also the difference between U5 mortality rate and infant mortality rate is very low for VAS to have any meaningful impact. On the contrary, scientific evidence indicates that there could be side effects of the administration of mega dose of Vitamin A (MDVA). These side effects of MDVA have not been systematically investigated. The universal VAS should be discontinued immediately as there are no likely benefits to U5 children. Background: Early diagnosis and effective treatment are the key areas in malaria control in India. Objective: The present study was carried out to assess the knowledge and skill of health personnel at primary care level and the logistic support related to the program at subcenter (SC) level. Methods: A cross-sectional, descriptive study was conducted among medical and paramedical personnel working at primary health-care institutions in two districts of West Bengal. Knowledge was assessed using a structured questionnaire while diagnostic skill and logistic support were assessed with structured checklists. Clinical skill was assessed with case vignettes. Results: Requisite knowledge on diagnostic procedure was found in two-third to three-fourth of health personnel while only 26.7% and 12.4%, respectively, knew the correct treatment of Plasmodium vivax and Plasmodium falciparum malaria. Median standardized score for knowledge was 50.0 while the scores for skill of preparing blood slide and for rapid diagnostic test were 70.0 and 57.1, respectively. Education and work experience were related to diagnostic skill but had little effect on knowledge. In clinical skill, medical personnel scored 50% or more in investigation and treatment aspects only. In another case vignette, health workers excelled over medical officers and other staff in all axes other than history taking and clinical examination although their performance was also suboptimal. 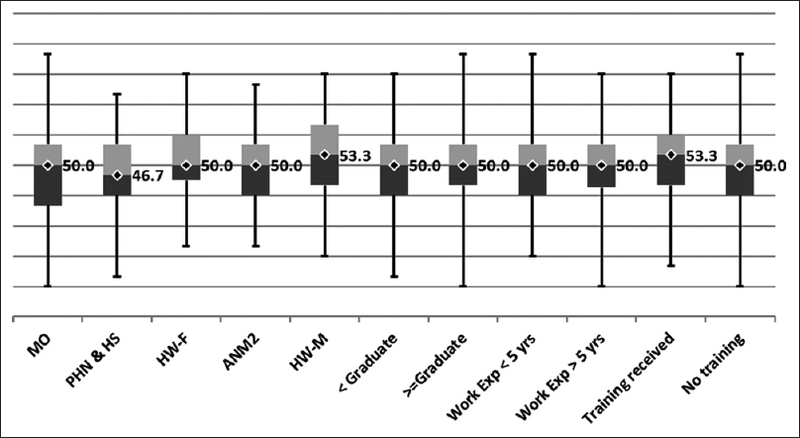 Formal training on malaria did not show any bearing on median knowledge and skill score. Supply of diagnostics and drugs was insufficient in majority of SCs. Conclusion: Renewed efforts are needed to create competent workforce and ensure adequate logistic supply. Background: Primigravidas (PGs) are high-risk women and anemia in pregnancy is one of the commonest causes of maternal morbidity and mortality. Objectives: The study was conducted to assess impact of anemia on course and outcome of pregnancy in anemic (Hemoglobin 8-10.9 gm%) and nonanemic PGs. Methods: This prospective longitudinal study was conducted in All India Institute of Medical Sciences, New Delhi. PGs 20-30 years age, gestation age 16-18 weeks, hemoglobin >8 gm%, live singleton pregnancy, and no other medical illness were recruited after informed consent. The women were Grouped 1 and 2 if hemoglobin was ≥11 gm% and 8-10.9 gm%, respectively. Complete hemogram done at enrollment, 28-30 weeks of pregnancy and 6 weeks postdelivery. Obstetric outcome and presence of anemia postdelivery were compared between groups using Chi-square test and Fisher's exact test. 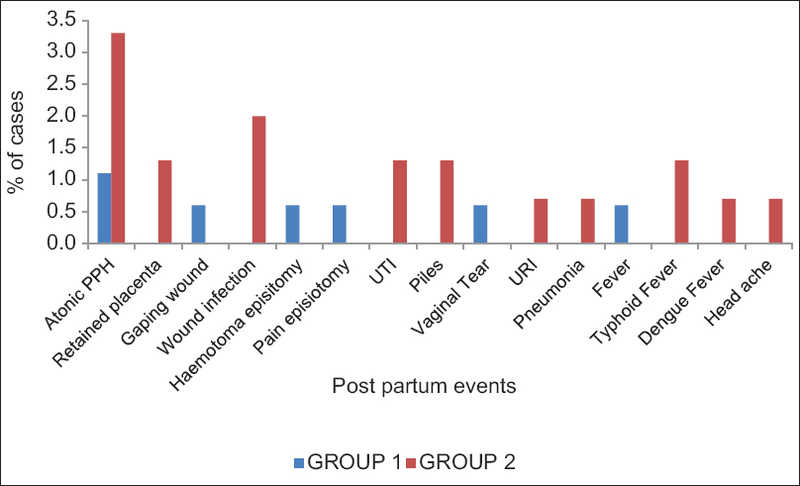 Results: A total of 377 PGs were enrolled and obstetric outcomes studied in 179 (Group 1) and 149 (Group 2) excluding women who did not complete study. There was no statistically significant difference in baseline characteristics, antenatal complications, gestational age, mode of delivery, and neonatal outcome. At 28-30 weeks of gestation, in spite of iron supplementation higher percentage (64.4%) (P < 0.05) of anemic patients remained anemic. At 6 weeks postdelivery, 15.6% and 24.2% were anemic in Group 1 and 2, respectively (P > 0.05). The adverse postpartum events (7.6%) were seen more in anemic compared to nonanemic pregnant women (P < 0.05). Conclusions: Cautious approach required in postpartum period of anemic women though antenatal period is similar as nonanemic pregnant women. Background: An insurance scheme called Jaminan Kesehatan Aceh (JKA) was established by the local government to achieve universal coverage for Aceh's population who were not registered under the national insurance scheme for the poor (Jamkesmas). Objective: This study was conducted to compare women's satisfaction before and after the implementation of JKA and across different insurance schemes. Methods: The study was conducted from July 2011 to July 2012 on satisfaction of maternal health services among 1197, 15-49 years aged old women living in eight districts of Aceh Province, Indonesia, and a cluster sampling technique was applied. Analysis of variance was used to assess the effects of different insurance schemes, period, and type of services on satisfaction with maternal health services. Results: Women were mostly satisfied with birth delivery services (mean score: 2.69) followed by postnatal care (mean score: 2.62) and antenatal care services (mean score: 2.37). Conclusion: Over the changing period, the average level of satisfaction in the JKA group increased significantly. Background: Skeletal fluorosis is a crippling disease resulting from excessive exposure to high fluoride from different sources. Objectives: To assess the prevalence of skeletal fluorosis in Bangarpet taluk of Kolar, to compare various epidemiological factors influencing the occurrence of skeletal fluorosis among the two groups with differential water fluoride levels, and to estimate fluoride levels in all the sources of drinking water in study areas. Methods: A cross-sectional study was conducted among the adults of three randomly selected villages of Bangarpet taluk, Thimmasandra, Batavarahalli, with high (>1.5 mg/L) and Maddinayakanahalli with normal (<1.0 mg/L) fluoride levels. A house-to-house survey was conducted by administering a semi-structured questionnaire. Skeletal fluorosis was assessed by three simple physical tests in the field followed by radiological confirmation among the positives. Fluoride levels of drinking water sources were estimated by the ion-electrode method. Chi-square and Fisher's exact tests were used as tests of association. Results: The prevalence of skeletal fluorosis at field level in both high and normal fluoride groups was 5.0%. Water fluoride levels in Thimmasandra, Batavarahalli, and Maddinayakanahalli were 4.13 mg/L, 2.59 mg/L, and 0.61 mg/L, respectively. Among the subjects with skeletal fluorosis, a significant difference was observed between socioeconomic status and prevalence of skeletal fluorosis in both high and normal fluoride groups (P < 0.05). 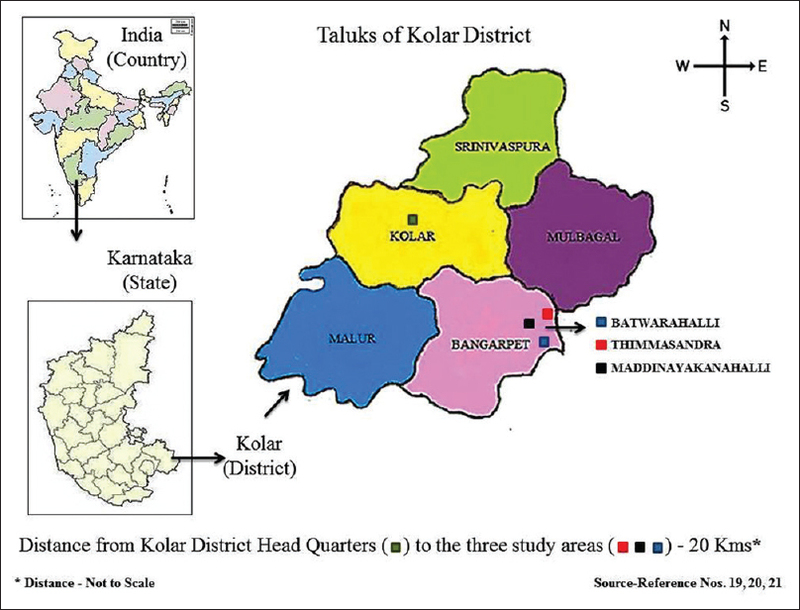 Conclusion: Skeletal fluorosis is a threat among elderly in Bangarpet taluk, Kolar district. Background: India is going through a phase of demographic transition leading to population aging and feminization of aging resulting in increased proportion of elderly women than men. Problems faced by the elderly women are more critical than men due to family and social conditions prevailing in India. Objective: The study made an attempt to assess the quality of life (QOL) using the World Health Organization QOL (WHOQOL-BREF) scale and sociodemographic factors affecting QOL of elderly women residing in a community setting in South Kerala. Methods: A community-based, cross-sectional study to assess the QOL of elderly women using WHOQOL-BREF questionnaire. Data were collected from 160 elderly women. Results: 2.5% (95% confidence interval [CI]: 0.07-4.84) of the study participants were having "very good" QOL. 38.8% (95% CI: 31.2-46.4) had "good," 43.1% (95% CI: 35.4-50.8) had "poor," and 15.6% (95% CI: 9.98-21.22) had "very poor" QOL, respectively. QOL was least in the psychological domain followed by physical and health-related, social, and environmental domains. Logistic regression revealed age above 70 years (adjusted odds ratio [OR] - 11.3), nonpossession of property (adjusted OR - 8.99), neglecting attitude by family (adjusted OR - 6.9), and absence of visit by friends and relatives (adjusted OR - 9.9) as risk factors, whereas residing in the urban area as a protective factor (adjusted OR - 0.1) for poor QOL. Conclusion: It is possible to improve the QOL of elderly women by providing financial security, ensuring care, and by enhancing social relationships of elderly women. Health inequities are disparities which can be avoided through rational actions on the part of policymakers. Such inequalities are unnecessary and unjust and may exist between and within nations, societies, and population groups. Social determinants such as wealth, income, occupation, education, gender, and racial/ethnic groups are the principal drivers of this inequality since they determine the health risks and preventive behaviors, access to, and affordability of health care. Within this framework, there is a debate on assigning a personal responsibility factor over and above societal responsibility to issues of ill health. One school of philosophy argues that when individuals are worse-off than others for no fault of their own, it is unjust, as opposed to health disparities that arise due to avoidable personal choices such as smoking and drug addiction for which there should (can) be a personal responsibility. Opposing thoughts have pointed out that the relative socioeconomic position of an individual dictates how his/her life may progress from education to working conditions and aging, susceptibility to diseases and infirmity, and the consequences thereof. The existence of a social gradient in health outcomes across populations throughout the world is a testimony to this truth. It has been emphasized that assuming personal responsibility for health in public policy-making can only have a peripheral place. Instead, the concept of individual responsibility should be promoted as a positive concept of enabling people to gain control over the determinants of health through conscious, informed, and healthy choices. 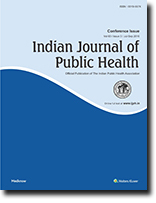 In this commentary, it is argued that greater attention paid to ethical considerations related to doing Public Health Research with Scheduled Tribes (STs) should be prioritized. Given the high levels of health needs among STs as well as their high levels of deprivation, cultural oppression, and impingement on their rights, there is a need to revisit our research practices to contribute to better health and overall empowerment. Specific strategies that could be integrated into research practice are offered. The paper concludes with a call for the development of national guidelines for Public Health Research with STs. Health system should be organized to meet the needs of entire population of the nation. Oral diseases are the most common of the chronic diseases, but there are few efficient dental care systems to cope with these problems. The present cross-sectional study was conducted among 135 dental care units of various primary health centers, community health centers, and general hospitals existing in the state to evaluate the government oral health-care infrastructure in Haryana. Data regarding provision of water and electricity supply, dental workforce and their qualification, number and type of instruments in the dental operatory unit, etc., were collected on a structured format. There is a shortfall in infrastructure and significant problem with the adequacy of working facilities. This can prove to be a big hurdle in the provision of adequate oral health care to people with greatest health-care needs. A great deal of effort is required to harmonize the oral health-care delivery system.